Master chord theory ... in minutes! The Chord Wheel is a revolutionary device that puts the most essential and practical applications of chord theory into your hands. This tool will help you improvise and solo, comprehend key structure like never before; instantly transpose any progression into each and every key; compose your own music, watch your songwriting blossom! 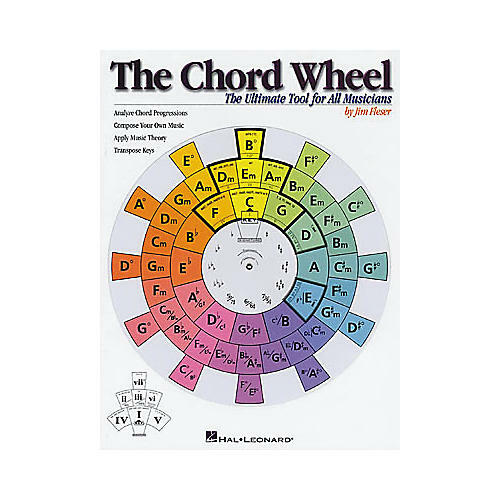 No music reading is necessary to gain from this chord finder from Hal Leonard. "This is the kind of device that players of any instrument can use to enhance their musical understanding. Chord and key relationships are inseparable, and learning these relationships is a must in becoming a successful musician," Alan Remington, Orange Coast College Music Dept.